Cherrapeno: A Winning Small Cake! I am chuffed to bits! This week I found out, that I am the winner of a lovely signed cake book by Roger Pizey, a professional baker and patissier! A couple of months ago, I spotted a little competition in the food section of The Guardian: Weekend magazine. You had to enter a photo of your best small cake. Easy? NO!!! Having a passion for baking, and cakes being quite high on the baking list, it was going to be hard to decide. In the end, the decision was made by the boys, they wanted coffee cupcakes. If you are a regular reader, you might be thinking that the photo looks a bit like the cappuccino muffins that I posted about just after Christmas. I have to agree, they do look similar. BUT, these little cakes are far lighter in texture and were made using a classic Victoria sponge recipe, and baked in a flexible silicone brioche mould. I did pinch the topping from the muffins, as it's one of our favourites. Thank you Dan Lepard, who writes the baking column, and the team from The Guardian for picking my photo - I am thrilled! In a large bowl, cream the butter and sugar together until light and fluffy - I use an electric hand whisk. Beat in the eggs, one at a time, adding a little flour with each egg, and all of the coffee powder. Gently fold in the rest of the flour, followed by the chocolate chips. Spoon into well greased muffin cups or paper cupcake cases. Bake for 18-22 minutes until springy to the touch. Remove from tins and cool on a wire rack. When cool, top with the cappuccino mascarpone topping. In a medium bowl, mix the mascarpone cheese, vanilla sugar and coffee powder together until blended. I just use a spoon to mix it together. 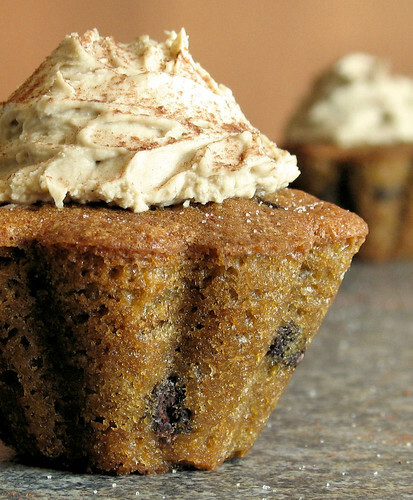 Add chocolate chips and spread onto cupcakes. Dust with a cocoa powder/sugar mixture. Congratulations Nic - You really do deserve it! Congrats!! That photo deserved to win! Cappuccino? Mascarpone? Chocolate chips? I'm IN. Seriously, those look delicious! And lucky you, a new book! Can't wait to see some gorgeous new adaptations from it. Congratulations on your win! I love things that aren't brioche made in brioche molds. Your cupcakes look great. And I like the topping too. All sugary and delightful. Yum! That's brilliant, Nic -- Congrats! I know you'll have fun baking goodies from your new book, but I'm waiting for the book, "Cherrapeno Bakes"! Wow, these sound (and obviously LOOK) amazing! Congrats on winning the book. Congrtulations, Nic! You truly deserve it! The photo is so beautiful, and the cupcakes look so yummy! Is there some kind of sauce poured over that cupcake - it looks so moist. It is a real grown-up cupcake. Great to win something now and then - well deserved. I'm going to bake these this weekend still. Nic, those sound lovely! Congrats on winning, you deserve it! Congratulations!!! Your pictures are always so great - doesn't surprise me one bit and I'm sure they taste as good as they look. Congratulations! Those cakes look really good! Congratulations again Nic....This is a lovely cupcake, I was drooling so much I nealy licked my computer screen. And, thanks so much for changing the post thingy, I clicked posts and it came up first time without shutting Explorer down. Valli - thank you and yes, I am more pleased about the photo being picked than getting the book! Sara - thank you so much!! Ann - yeah, what are you waiting for - get cooking those cupcakes!! Seriously, thank you and I’m going to post some recipes soon. Nikki - welcome and thank you so much for your lovely comments! Manju - ha ha! I don’t think so, but that is a great title! Aran - lol, book or cake? Miri - thanks so much, you’re very kind! Nina - there isn’t a sauce, but that would be a great addition, I’m thinking Tia Maria would be pretty good!! Giz - thanks so much! Sue - thanks, and you’re welcome! Congratulations on winning the lovely book. Congratulations Nic on winning the book - your photo's are always stunning and you really do deserve it! Congratulations, as always these look and sound wonderful that's why you were chosen. GOOD FOR YOU girl!! You deserve it & have great reason to be chuffed!! The picture (as all others of yours) is a winner! Well done...look forward to yummy cakes from the signed book!! These are just too cute! I love them in the mold! Congratulations! I think these definitely look like winning cakes. I love the way you have presnted that icing on top. It is making me drool! What a gorgeous little cake. Congratws on the win! Congrats! Your win was well deserved. That little cake is beautiful! Congratulations - and I can see why they picked yours! Congrats Nic, your cooking and photography skills are both way up there. Well deserved win. Congrats on winning the book! Your cupcakes look wonderful. How many cakes does this recipe make? iheartmj - this recipe makes about 7-8 medium sized cupcakes. congrats! how exciting! so happy for you!